From 1952 to 1967, there were two Best Actress awards presented, Best British Actress and Best Foreign Actress. From 1968 onwards, the two awards merged into one award, which from 1968 to 1984 was known as Best Actress. From 1985 to present, the award has been known by its current name of Best Actress in a Leading Role. Note: The 2013 ceremony was the first time in the history of BAFTA that two French actress were nominated for French-language performances in the Best Leading Actress category. Marion Cotillard for Rust and Bone and Emmanuelle Riva for Amour. Note: Meryl Streep and Judi Dench tie for the record of a total of 15 BAFTA film nominations, with Streep having 12 Best Actress nominations and 3 Best Supporting Actress nominations. Dench has 5 Best Actress nominations and 9 Best Supporting Actress nominations. Dench's 15th nomination is for Best Newcomer in 1966 (which she won). This gives her 6 BAFTA film wins. 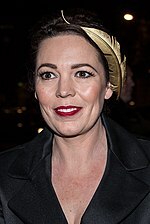 In addition, she has won 4 BAFTA television awards (from 12 nominations). In total she has received 27 BAFTA film & TV nominations with 10 wins. Dench also received an honorary BAFTA, the BAFTA Fellowship, in 2001. Note: Maggie Smith has a total of 13 BAFTA film nominations, for Best Actress (8), Best Supporting Actress (4) and Best Newcomer (1), winning 5. She also has 5 BAFTA television nominations. This gives her a total of 18 BAFTA film & TV nominations. In addition, Smith has received two honorary awards, the BAFTA special award (1993) and the BAFTA Fellowship (1996). ^ Wendy Hiller won the Academy Award for Best Supporting Actress. ^ Lila Kedrova won the Academy Award for Best Supporting Actress. ^ Goldie Hawn won the Academy Award for Best Supporting Actress. ^ Maggie Smith won the Academy Award for Best Supporting Actress. ^ Meryl Streep won the Academy Award for Best Supporting Actress. ^ Jessica Lange won the Academy Award for Best Supporting Actress. ^ Peggy Ashcroft won the Academy Award for Best Supporting Actress. ^ Kim Basinger won the Academy Award for Best Supporting Actress. ^ Rachel Weisz won the Academy Award for Best Supporting Actress. ^ Alicia Vikander won the Academy Award for Best Supporting Actress. ^ Dixon, Marcus James (10 January 2017). "BAFTA Awards 2017: Full list of nominations led by 'La La Land,' 'Arrival,' 'Nocturnal Animals'". Goldderby.